Fostering entrepreneurship and intrapreneurship: these core competences are central to the EBC*L initiative. Lifelong learning: The EBC*L is well established at schools, universities and other educational institutions. Mobility: across educational as well as national borders (=bridging). For example: Anyone who successfully completes an EBC*L Level A exam at a school in one country is able to take the Level B exam at a university in another country. Linkage to the real economy: The EBC*L catalogue of learning objectives was created in intense cooperation with the real economy. Its practical relevance and applicability is underlined by its implementation in countless businesses’ career and education programs. No barriers to entry: As no prior qualifications are necessary, anyone is free to undertake an EBC*L education and its exams. Affordable education: Both the education and the EBC*L exam are extremely affordable and cost only a fraction of other educational programs in business administration (e.g. MBA). Language and mathematical core competences: The EBC*L exam is not just a multiple choice exam. It challenges its candidates with comprehension questions and case studies, which have to be answered in their own words, including appropriate calculations. Therefore, it is necessary for candidates to practice these competences in the preparatory courses. 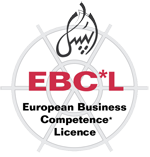 Foreign language competences: The EBC*L education and exam can be taken in 24 languages including Arabic. The exam is acknowledged in every country regardless of which language it has been completed in. Output oriented: The EBC*L system is designed to verify acquired knowledge, regardless of how that knowledge has been acquired. Quality assurance: The standardized EBC*L catalogue of learning objectives, continuous schoolings of the EBC*L staff at training institutes, constant and rigorous evaluation through a feedback system in the case of high fail rates. IT competences: A special e-learning program and a corresponding blended learning seminar were developed to give candidates an ideal preparation for the EBC*L exams. Thus knowledge can be conveyed by state-of-the-art teaching and learning methods. Train the Trainer: In Train the Trainer seminars, the newest and most innovative teaching methods to convey business competences are explained to the trainers. ‘To-do’s’ and ‘not-to-do’s’ when handling e-learning and blended training concepts are explained. Standardized exam: Guarantees the international comparability of the results.